Take Lake Mead Parkway EAST to the park entrance. After the toll booth, keep right. The 1.2 & 2.4 mile swims are at Boulder Beach Special Events Beach. After the toll booth, keep right and drive approximately 12 miles. The turn off will be on your left. Down the hill, keep RIGHT. Drive 1.5 miles towards the lake and following volunteer instructions for parking. Take the US 93/95 South towards Boulder City. In Boulder City, turn Left at the first (and only) traffic light towards Hoover Dam. Park entrance will be on your left. 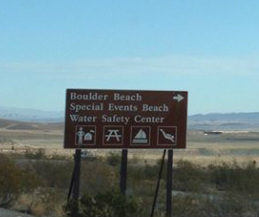 After the toll, drive approximately 3 miles and turn RIGHT at the Boulder Beach Special Events Beach. Keep to your right and continue on 1.5 miles towards the lake and follow instructions for parking.